Facebook will discontinue the Facebook Messenger for Windows API, which was also used by FB Messenger for Linux. This application will stop working on March 3, 2014! 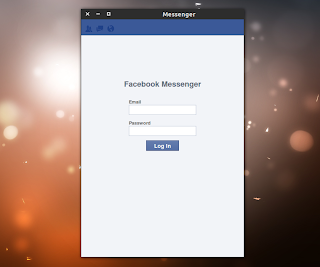 FBMessenger is a stand-alone Facebook Messenger app for Linux, very similar to the official Messenger for Windows. desktop popup alerts for notifications (only when you turn the chat on). Also, if you turn off the chat in Facebook and then log in using FBMessenger, the application doesn't turn the chat on (doesn't sets you online/visible) like it does when using Pidgin or Empathy. FBMessenger is pretty new and lacks some features but hopefully more will be added soon. For instance, right now the only way the application notifies you of new messages is, just like the Facebook website itself, through a sound and only when you're online so if you turn the chat off, you won't get new message notifications, but chat window flasing is on the todo list. Arch Linux users can install FBMessenger via AUR. For other Linux distributions, get the Facebook Messenger for Linux source code via GitHub (there are scripts available for building rpm and debian packages). If you encounter bugs, report them @ GitHub.